Generating leads – both high in quantity and quality – is a marketer’s most important objective. A successful lead generation engine is what keeps the funnel full of sales prospects while you sleep. Surprisingly, only 1 in 10 marketers feel their lead generation campaigns are effective. So, what gives? There can be a lot of moving parts in any lead generation campaign and often times it’s difficult to know which parts need fine tuning. In this guide, we expose the top 30 techniques marketers should utilize to increase leads and revenue. These tactics have been tested over the past 7 years and have been used by 8,000+ Hubspot customers to generate more than 9.8 million leads. The tips in this ebook will cover each of these elements so that each component is fully optimized to help you generate the most leads for your business. This preview; however, will give you one tip from each section. Yea, we know, we are one big lead gen tease. To give you a taste of what’s in the ebook, we’ll give you a preview to 4 of the lead gen ideas, 1 from each section. 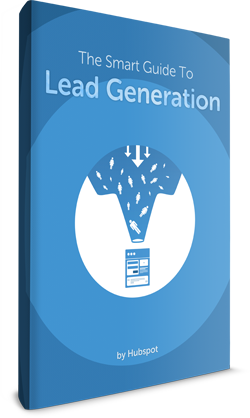 You’ll want to download The Smart Guide To Lead Generation to get all 30 in full-length though. Even if someone completes a form on your website (thus they’ve converted as a lead), don’t stop there. increasing engagement is also a top priority for marketers so that prospects turn into loyal fans. Once someone reaches a “thank you page,” the page that a visitor arrives on after completing a form, use that space as an opportunity to promote more offers and content. Sometimes people won’t fill out a form just because it “looks” long and time-consuming. If your form requires a lot of fields, try to make the form look shorter by adjusting the styling. Reduce the spacing in between fields or align the titles to the left of each field instead of above it so that the form appears shorter. If the form covers less space on the page, it may seem as if you’re asking for less. That’s a little teaser of what’s inside The Smart Guide To Lead Generation — Now, go get all 30 full-length lead generation tips, it’s 42 pages and packed with actionable ideas. Jessica is Head of Enterprise Marketing at HubSpot and author number of marketing eBooks, with more than 215 thousand downloads. Jessica is responsible for helping HubSpot generate over 60 thousand leads per month and for teaching businesses how to build effective online marketing strategies. Jessica's work at HubSpot has been featured in The Atlantic & on the Today Show. You can reach her @jessicameher or on LinkedIn.